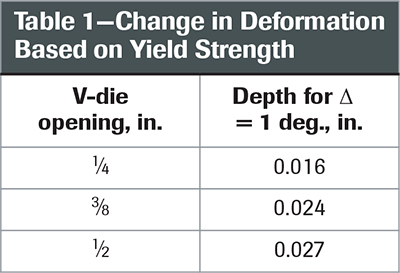 One of the unavoidable side effects of press-brake operation is frame deformation. We’re bending steel parts with other steel, that of the press brake, which for physical reasons will deflect. In particular, the ram will bow in the center (Fig. 1). At that point the punch will be farther away from the die, resulting in a wider angle and yielding a bent profile with a boat-like shape (Fig. 2). Even a small angle difference can turn metalforming into a process full of pitfalls. Fig. 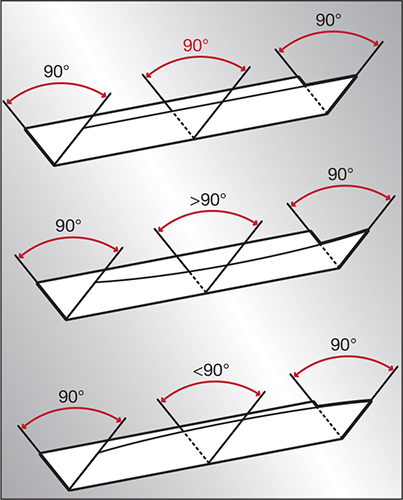 1—When press-brake bending, frame deflection will cause the ram to bow in the center. At that point the punch will be farther away from the die. This can mean trouble when attempting to keep parts within tolerance. The deformation described above can be compensated for with crowning, where the table pushes upward to keep the die at a consistent distance from the ram. There are two types of crowning: one uses a series of wedges to raise the die mechanically; the other uses short-stroke hydraulic cylinders embedded into the bench. But how much crowning is just the right amount? Most manufacturers rely on data tables calculated based on the press-brake structure and sheetmetal characteristics as declared by the foundry. Everything is fine, right? Nope. Actually, this method often does not work because sheetmetal behavior is unpredictable. It has a high variability that depends on a series of factors. Knowing them and, when possible, compensating for them is essential in order to save time and material in tests and samples. Especially today, in an age of smaller batches, obtaining the correct bend angle on the first try is a must. Fig. 2—Bowing of the ram due to frame deflection results in a wider angle and yields a bent profile with a boat-like shape. Even a small angle difference can turn metalforming into a process full of pitfalls. To properly navigate the deformation minefield, mind these four factors that impact crowning. What does “A36” mean when describing steel? Steel is labeled according to its yield strength. This value is highly variable and depends on impurities in the material and imperfections in production techniques. To avoid the risk of building weak structures, regulations require a declaration of the minimum yield strength. So, any steel with a yield strength greater than 36,000 psi will be labeled as A36. As a result, 41,000-psi steel still will be sold as A36, in spite of being 13 percent harder. The increased resistance will impart a higher force on the press brake, which will cause the ram to bow even more. For instance, switching from a 36,000- to a 41,000-psi steel will result in a deformation difference of roughly 0.002 in. in depth. Yet, this small curve causes a change of nearly 1 deg. in a 0.3-in. V-die (Table 1). In other words, a thickness of less than that of a single sheet of paper (less than 0.04 in.) causes remarkable differences. Bear in mind that narrow openings such as these often are used to bend thin sheet for high-quality products. Label data on the steel we buy, which may or may not be reliable in the first place, become completely worthless when we modify the sheet. Holes change strength along the bending line, whether the holes are produced via thermal cut or by drilling or milling. The same is true if the same piece has bends. In addition, punched holes introduce internal stresses that make it even more difficult to consider crowning as a fixed amount of deformation. Steel is a living thing. Rolling directions create fibers in the structure, so bending across or along the grain will affect both the required bending force and the springback. A recently pickled sheet is harder than an aged or oxidized sheet, even after just a few weeks. Moreover, bending a hot plate is not the same as bending an ice-cold plate. Temperature in the shop has an influence on forming, and may lead to different results. Even dimensional figures are variable, especially thickness. For example, the EN 10051:1991+A1:1997 regulation divides sheetmetal into five groups. In Table 2, let’s consider steel roughly between 37,000 and 49,000 psi, in thicknesses to 0.1 in. and 4-5 ft. wide. A sheet with a 0.1-in. nominal thickness can fall anywhere within a 14-percent bracket, and within a 31-percent bracket in the worst-case scenario. 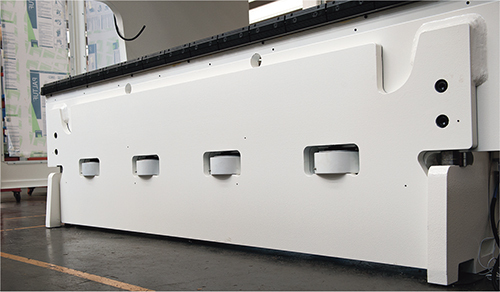 To ensure quality parts, a press brake must compensate for frame deflection via accurate crowning. New technology can accomplish this. In one case, a sensor in the press-brake ram detects bowing. Cylinders in the table (pictured) raise the die accordingly, using sensors to match the height of the punch and die across the profile. While shearing alters the grain in sheetmetal, plasma, laser and oxyfuel cutting all generate localized thermal shocks on sheet edges and hole perimeters that cannot be ignored. For these reasons, a good press brake cannot and must not rely upon any type of database, and, instead, should be based on estimating or forecasting software. Simply put, no algorithm can predict sheetmetal reaction. To think that steel behaves as a perfect and unchangeable material is a delusion that soon leads to a bad awakening. Down the line, errors in forming lead to difficulties in welding, painting and joining, especially on close-tolerance parts. Material waste and working hours will skyrocket. These four factors can drastically reduce company margins if they are ignored. Press brakes and their operators must know the sheetmetal, and must adapt to changes in order to achieve ideal results. Information for this article was supplied by Gasparini North America Inc., Avon, OH; www.gasparininorthamerica.com.